Advanced technology includes Improved texture control, stronger milling heads, unique Force Flow sound/air chamber design which results in 50% noise reduction, improved motor cooling, and longer life. 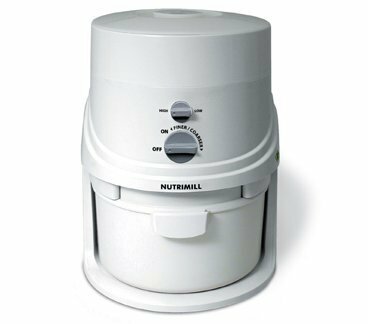 The Nutrimill uses a high-speed impact chamber to create flour from grains and beans. It allows you to grind up to 20 cups of flour at one time with no gumming, overheating, or jamming. Nutrimill is versatile, convenient, powerful and fast. Because of its Whisper Quiet™ technology, it is one of the quietest impact mills on the market today. Definitely an important addition to any bread maker’s kitchen.